Source: Spiewak R, Lundberg M, Johansson SGO, Buczek A. Allergy to pigeon tick (Argas reflexus) in Upper Silesia, Poland. Ann Agric Environ Med 2006; 13 (1): 107-112. Abstract: The pigeon tick Argas reflexus is avian ectoparasite that typically feeds on pigeons. When devoid of a natural host, the ticks can also attack humans. In Upper Silesia, southern Poland, people living in the vicinity of the birds' nesting sites are frequently bitten by A. reflexus. The bites can provoke serious allergic reactions, including fatal anaphylactic shock. 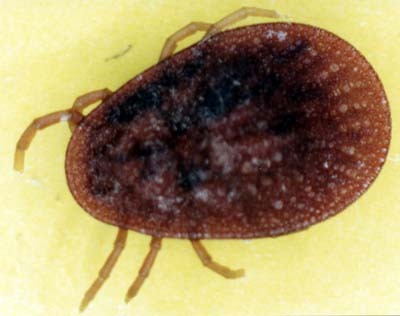 In the present study, residents of 9 apartments invaded by pigeon ticks were invited to undergo medical examination, skin prick tests (SPT) and determination of specific IgE to A. reflexus. The test allergens were prepared of ticks collected on-site. Out of 18 residents living in the infested apartments, 15 accepted the invitation. In this group, 8 persons complained of tick-related health problems, positive SPT to A. reflexus were found in all of them, and specific IgE was detectable in 3 persons (range: 0.38-0.84 kUA/l; CAP class 1-2). Final clinical diagnoses were established of generalised urticaria with asthma in 1 person, generalised urticaria in another 1, and local allergic reactions to tick bites in the remaining 6. Among 7 symptom-free residents, all test results were negative. Besides the study group, the paper also describes the case of a person who developed hypersensitivity to A. reflexus as a child, after a few visits to an abandoned dovecote. 30 years later, positive SPT (++) and specific IgE (0.78 kUA/l; CAP class 2) were still present despite no further re-exposures. The article also discusses available pest control measures against A. reflexus. Key words: Argas reflexus, pigeon tick, soft tick, avian parasites, tick bites, allergic reactions, allergy. Upper Silesia (Gorny Slask) is a highly urbanised and densely populated area in southern Poland. For centuries pigeon breeding has been a popular pastime activity in this region. Many dovecotes were set up in attics of houses (Fig. 1) or in the courtyards, next to human dwellings. With time, many of the birds became feral, and nowadays pigeons provoke nuisance and public health concerns. In the present article, we describe the development of allergy to pigeon ticks (Argas reflexus) among residents of 9 apartments invaded by ticks from neighbouring nesting sites of feral pigeons. Figure 1. 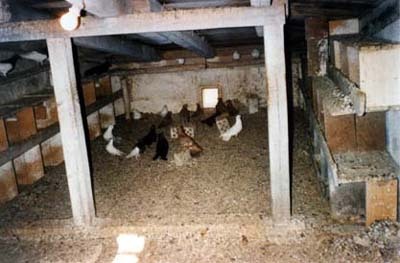 Dovecotes in attics are typical habitats of Argas reflexus, and pose serious health risk to people living in the building. Study sites. There were 9 apartments invaded by pigeon ticks, located in 6 separate multi-storey buildings in 4 neighbouring towns of Bytom, Swietochlowice, Chorzow, and Katowice in Upper Silesia. Detailed description of the apartments and their surroundings is given in Table 1. Collection of ticks for identification. The ticks are active during the night and spend the daytime hidden in crevices. Therefore, crevices of the walls and woodwork were examined for the presence of ticks by using a flashlight. Special attention was paid to faeces of the ticks, as tick habitats are marked by accumulation of excrements . At each site, several specimens at different developmental stages were found, i.e. females, males, nymphs I and nymphs II. Collected ticks were preserved in 70% ethyl alcohol. Under laboratory conditions, the specimens were prepared according to , mounted in Faur's fluid and identified as A. reflexus based on their morphologic features (Fig. 2) [2, 29]. Figure 2. Argas reflexus female, × 8. Its length × breadth ranges from 4.5-10.3 × 3.9-7.2 mm. Study group. We offered medical advice to all residents of the infested apartments. Of the 18 persons concerned, 15 agreed to participate in the study (Tab. 1). Among them, 8 persons complained of health problems related to tick bites ("Patients", 3 men and 5 women aged 25-78 years). The remaining 7 participants (4 men and 3 women aged 14-47 years) were symptom-free and asked for examinations because of their concerns regarding the tick invasion. Their test results were used as reference in this article and they are further referred to as "Controls". Preparation of A. reflexus extracts for allergy testing. Whole bodies of adult ticks collected in the infested apartments were air-dried, crushed and suspended (0.10 g/ml) in a mixture of glycerol and physiological saline (1:1 v/v). After overnight incubation at 4°C, the suspension was centrifuged, sterile filtered, and diluted to the final concentration of 5,000 PNU/ml according to . 5 volunteers (members of laboratory staff or nurses) were skin prick-tested with this extract and none of them reacted. For the detection of A. reflexus-specific IgE (sIgE), ImmunoCAPs™ were produced according to  from crushed, air-dried bodies of ticks collected on-site. The extract was covalently coupled to the solid phase following the method described in . Medical tests. Study participants underwent history taking using standardised questionnaire, skin prick tests (SPT), total IgE (tIgE) and A. reflexus-specific IgE (sIgE) determination. SPT were carried out on the anterior forearm surface using standard lancets (Allergopharma, Germany). The test site was observed after 20 min and the size of wheal reaction was recorded. The results were scored through comparing the diameter of wheals at test site with the diameter of the control wheal elicited by histamine solution (1 mg/ml). Test wheal with diameter < 50% of the control wheal's diameter was considered as a negative reaction (-), wheal with diameter from 50-99% was scored as (+), from 100-150% as (++), and above 150% as (+++). Blood samples were also taken from the study participants for IgE determination. Total IgE and A. reflexus-sIgE levels in serum were measured with the fluoro-enzymatic immunoassay (FEIA) using UniCAP™ 100E apparatus according to the manufacturer's instructions (Pharmacia Diagnostics AB, Uppsala, Sweden). Total IgE concentration was measured using standard reagents from Pharmacia, results below 120 kU/l were considered normal. For the determination of A. reflexus-sIgE, the above described, custom-made ImmunoCAPs™ were used. Results equal or higher than 0.35 kUA/l were regarded as positive. 1Patient numbers are consistent with Table 2. 2M - male, F - female, age given in years. 3The patient was active as pigeon breeder since childhood. All 8 patients with health complaints related to tick bites were diagnosed with allergy to A. reflexus. Six persons suffered from local allergic reactions of the skin. In the 2 remaining patients, there were systemic allergic reactions to the tick's bites manifesting as generalised urticaria in 1, and generalised urticaria with asthma in the other. The tick bites and bite-related symptoms were typically noted during the night or the following morning. Positive SPT to A. reflexus were recorded in all 8 patients, A. reflexus-sIgE was detected in 3 of them. Detailed information on tick bite-related symptoms and allergy test results are given in Table 2. Regarding the 7 "Controls", their reactions to tick bites did not exceed beyond transient pain and the development of a dark-red spot at the bite site. Neither positive SPT, nor sIgE to A. reflexus was detectable in this group. 1SPT - skin prick tests; Beside A. reflexus allergen, the patients were tested with Animal Danders I, Trees I, Trees II, Grasses/Cereals, Weeds, Fungi I, Dermatophagoides pteronyssinus, Blatella germanica (Allergopharma, Reinbeck, Germany). 2tIgE - total immunoglobulin E in serum; normal range is below 120 kUA/l. 3Due to the patient's history of severe systemic reactions, skin tests were performed with A. reflexus allergen extract diluted to 20% of the original concentration. During preparations for the study, it was accidentally discovered that the first author of this paper was hypersensitive to A. reflexus. After some thought, he could recall the circumstances behind this sensitisation, which occurred about 30 years earlier (mid 1970s) in Tarnow - a town located in southern Poland, 180 km east of the present study site. As a child of about 8 years, he attempted to clean an abandoned dovecote in the attic of a house. After several visits to the site, he could not continue with this activity due to intense itching of the skin, wheals, rhinorrhea and shortness of breath, which appeared within minutes after entering the dovecote. Altogether, there was no more than a 2-week time span between the first and the last visit in the dovecote, and he has had no further visits to pigeon nesting sites ever since. The whole story remained forgotten until the present study. SPT with A. reflexus-allergen gave a (++)-reaction, the sIgE level was 0.78 kUA/l (CAP class 2), total IgE was 490.3 kU/l. The person described here was atopic with confirmed Type I-hypersensitivity to multiple aeroallergens. Feral pigeons are distributed worldwide and live close to human population, causing serious health problems. The birds may vector as many as 60 human pathogens - viruses, bacteria, fungi and protozoa [14, 31]. Also blood-sucking ectoparasites of pigeons can prey on humans, among these pigeon flea Ceratophylus collumbae , red blood mite Dermanyssus gallinae [12, 26], northern fowl mite Ornithonyssus sylviarum , and most frequently pigeon tick Argas reflexus [19, 21, 28, 33]. Severe allergic reaction of a person bitten by pigeon ticks was first reported from Upper Silesia in 1973 by Grzybek et al. (cited after ). Health concerns of the public were further stimulated by subsequent reports on the frequent appearance of A. reflexus in local pigeon nests . Finally, a person died of anaphylactic shock after A. reflexus bite in 1993 . Since then, pressure has been put on house owners to remove pigeon nests. When improperly carried out, however, such removals may cause more harm than benefit. If no sufficient pest control is carried out at the site, the ticks remain and eventually seek another host. In urban areas, people frequently act as such "makeshift" hosts. Typically, A. reflexus-invasions on people start after removal of pigeon breeding sites in the neighbourhood, or take place in apartments converted from lofts previously inhabited by pigeons. This is true for the majority of apartments described in the present study (compare Table 1). Successful removal of blood-sucking parasites from pigeon nesting sites is a key measure to prevent allergic reactions to A. reflexus in people. Unfortunately, the tick possesses a range of biological features that make it difficult to eradicate. Adult A. reflexus can survive 5 or more years without feeding . Anecdotal reports were published of people first invaded by pigeon ticks after as many as 13 years after removal of neighbouring dovecotes . The larvae of A. reflexus can survive 1 year without feeding, whereas unfed nymphs can stay alive for 3 years or more . Pigeon ticks hide in the deepest cracks, which are difficult to penetrate for pesticides; moreover, the tick can halt respiration for a few hours, which makes short-acting pesticides ineffective [3, 7]. Even when using long-term residual pesticides, A. reflexus is difficult to exterminate due to its long life cycle. Finally, thousands of ticks can be found in one pigeon nest (Mayer 1954, cited after ) - such vast numbers make A. reflexus very difficult to eradicate completely. Repeated treatments by a pest control professional are necessary . Until successful eradication of the tick, a provisional measure can be implemented that prevents A. reflexus from entering human dwellings: Double-sided adhesive tape should be stuck to windowsills and around other openings used by the parasite for entering the apartment. When crawling over the tape, A. reflexus sticks to it and cannot proceed (Haag-Wackernagel, personal communication). This simple measure helps to control the invasion before professional pest control is carried out. application of propoxur-based contact pesticide to kill the ticks. When this scheme is not applicable or not effective, other pesticides could be tried, which were reported to be effective against ticks of Argas family. These include permethrin , ivermectin , and Bacillus thuringiensis . Finally, repellents could be tried in order to keep the ticks away from people. Permethrin and DEET (N,N-diethyl-3-methyl benzamide) were shown to be effective against Argas persicus (a relative of A. reflexus) [10, 20, 22]. After successful eradication of pigeon ticks, measures should also be undertaken to prevent possible reinvasions: All openings that could be used by feral pigeons for entering the building should be permanently obstructed (e.g. by mounting wire netting or bricking up) and external breeding sites protected with pigeon deterrent systems . In the present study, most persons with allergy to tick bites were non-atopic. This indicates that A. reflexus-allergen is strong enough to induce hypersensitivity also in people without an individual tendency to developing allergies. Similar observations were made previously [19, 27]. Out of 18 persons living in the infested apartments (including those who declined to participate in the study), 8 (44%) were diagnosed with allergy to tick bites. Residents of 6 out of 9 infested apartments, experienced their first allergic symptoms to tick bites in the same year when A. reflexus appeared in the apartment (A, B, C, F, G, and H in Table 1). This suggests a rapid sensitisation; thus, again strong sensitising properties (though it cannot be excluded that the symptoms only turned the residents' attention to the ticks that were present previously). The case description included in this article provides yet another clue to the strong allergising potential of A. reflexus and a rapid development of hypersensitivity to pigeon tick bites: The sensitisation developed after a few visits to an abandoned dovecote, and within less than 2 weeks. Once induced, the allergy to pigeon tick persisted for 3 decades without known re-exposure. Previous studies suggest that diagnosis of A. reflexus-allergy may sometimes be hampered by false-negative and irrelevant positive results when using whole-body extracts of A. reflexus for skin prick tests (SPT) and specific IgE . In our study, all 8 persons with tick-related symptoms had positive SPT to A. reflexus and all "Controls" remained negative. This means that we did not see either false positive nor false negative results while using whole-body extract of A. reflexus for SPT. However, the determination of sIgE appeared in our hands less sensitive than SPT, as it was detectable only in 3 out of 8 people with tick-related symptoms. Therefore, whole-body extract of pigeon tick seems indeed not to be the best substrate for sIgE determination. An improvement can be hoped in the future when the recently cloned major allergen of A. reflexus saliva, Arg r 1 finds its way into diagnosis . The presence of nesting sites of feral pigeons in the vicinity of human dwellings is an important risk factor for invasions of people by A. reflexus. Removal of pigeons without proper eradication of pigeon ticks further increases the risk of A. reflexus attacks on humans. A considerable portion (>40%) of people bitten by A. reflexus develop hypersensitivity manifesting as local or systemic allergic reactions. Once acquired, allergy to A. reflexus bites can persist over decades without further re-exposures. This study was partly financed from the grant 501/PKL/43/P of the Jagiellonian University Medical College in Krakow, Poland. We thank Dr Krystyna Kubicka and Dr Dariusz Ciura (Katowice) for their on-site help while performing the study, and Prof. Daniel Haag-Wackernagel (Basel) for critical reading and comments on the article. Initial results of this study were presented at the XXIII EAACI Meeting in Amsterdam, 2004 . *This article is dedicated to the memory of 65 people killed on 28 January 2006 in the collapse of exposition hall at the VII International Fairs of Racing Pigeons "PIGEON 2006" in Katowice, Poland. Buczek A: Charakterystyka Argas (A.) reflexus (Fabricius, 1794) (Acari: Ixodida: Argasidae) - pospolitego pasozyta na Gornym Slasku. Wiad Parazytol 1991, 37, 375-380. Buczek A: Morphological variability of Argas (A.) reflexus (Fabricius, 1794) (Acari: Ixodida: Argasidae) females and males from a Silesian population. Z Angew Zool 1993, 4, 409-419. Buczek A: Okreslenie wrazliwosci glodnych larw Argas (A.) reflexus (Fabricius, 1794), (Acarina, Argasidae) na dzialanie wybranych akarycydow. In: XIV Meeting of the Polish Society of Parasitology, Ksiaz Castle, 24-26 September 1984, 13. Wroclaw 1984. Buczek A: Studies on the biology of Argas (A.) reflexus Fabricius, 1794 (Acari: Ixodida: Argasidae). I. Effect of temperature and relative humidity on embryonic development and egg hatch. Folia Biol (Krakow) 1988, 36, 239-264. Buczek A, Solarz K: Atakowanie ludzi przez Argas (A.) reflexus (Ixodida, Argasidae) - grozne pasozyty czlowieka i zwierzat. Pol Tyg Lek 1993, 48, 238-239. Ceska M, Lundkvist U: A new and simple radioimmunoassay method for the determination of IgE. Immunochemistry 1972, 9, 1021-1030. Dautel H, Kahl O: Ticks (Acari: Ixodoidea) and their medical importance in the urban environment. In: Robinson WH, Rettich F, Rambo GW (Eds. ): Proceedings of the 3rd International Conference on Urban Pests. Prague 1999, 73-82. Dautel H, Knulle W: Cold hardiness, supercooling ability and causes of low-temperature mortality in the soft tick, Argas reflexus, and the hard tick, Ixodes ricinus (Acari: Ixodoidea) from Central Europe. J Insect Physiol 1997, 43, 843-854. Dautel H, Knulle W: The influence of physiological age of Argas reflexus larvae (Acari: Argasidae) and of temperature and photoperiod on induction and duration of diapause. Oecologia 1998, 113, 46-52. Dusbabek F, Rupes V, Sbreveimek P, Zahradnickova H: Enhancement of permethrin efficacy in acaricide-attractant mixtures for control of the fowl tick Argas persicus (Acari: Argasidae). Exp Appl Acarol 1997, 21, 293-305. Ewan PW, Coote D: Evaluation of a capsulated hydrophilic carrier polymer (the ImmunoCAP) for measurement of specific IgE antibodies. Allergy 1990, 45, 22-29. Haag D: Brütende Straßentauben als Ursache einer Invasion von Dermanyssus gallinae (De Geer, 1778). Der Praktische Schädlingsbekämpfer 1988, (8), 180. Haag-Wackernagel D: Parasites from feral pigeons as a health hazard for humans. Ann Appl Biology 2005, 147, 203. Haag-Wackernagel D, Spiewak R: Human infestation by pigeon fleas (Ceratophyllus columbae) from feral pigeons. Ann Agric Environ Med 2004, 11, 343-346. Hassanain MA, el Garhy MF, Abdel-Ghaffar FA, el-Sharaby A, Abdel Megeed KN: Biological control studies of soft and hard ticks in Egypt. I. The effect of Bacillus thuringiensis varieties on soft and hard ticks (Ixodidae). Parasitol Res 1997, 83, 209-213. Herrmann J: Taubenzeckenbekämpfung. Umweltmedizinischer Informationsdienst 2000, 3, 484. Hilger C, Bessot JC, Hutt N, Grigioni F, Deviller P, de Blay F, Pauli G, Hentges F: IgE-mediated anaphylaxis caused by bites of the pigeon tick Argas reflexus: Cloning and expression of the major allergen Arg r 1. J Allergy Clin Immunol 2005, 115, 617-622. Kleine-Tebbe J, Haut A, Heinatz A, Schröder I, Dautel H, Nordskov Hansen G, Haustein UF: Bites of the European pigeon tick (Argas reflexus): Risk of IgE-mediated sensitizations and anaphylactic reactions. J Allergy Clin Immunol 2006, 117, 190-195. Kumar S, Prakash S Kaushik MP, Rao KM: Comparative activity of three repellents against the ticks Rhipicephalus sanguineus and Argas persicus. Med Vet Entomol 1992, 6, 47-50. Lindsay Snow RW, Armstrong JR, Greenwood BM: Permethrin-impregnated bednets reduce nuisance arthropods in Gambian houses. Med Vet Entomol 1989, 3, 377-383. Madel W: Auftreten und Bekämpfung der gefährlichen Taubenzecken. Der Geflügelzüchter 1949, 2, 10. May JC, Sih JT, Miller JR, Seligmann EB Jr: Optimization of parameters in protein nitrogen unit precipitation procedure for allergenic extracts. J Allergy Clin Immunol 1979, 63, 87-97. Montasser AA Gadelhak GG, Tariq S: Impact of ivermectin on the ultrastructure of the testis of Argas (Persicargas) persicus (Ixodoidea: Argasidae). Exp Appl Acarol 2005, 36, 119-129. Regan AM, Metersky ML, Craven DE: Nosocomial dermatitis and pruritus caused by pigeon mite infestation. Arch Intern Med 1987, 147, 2185-2187. Rolla G, Nebiolo F, Marsico P, Guida G, Bigo P, Riva G, Zanotta S: Allergy to pigeon tick (Argas reflexus): Demonstration of specific IgE-binding components. Int Arch Allergy Immunol 2004, 135, 293-295. Sirianni MC, Mattiacci G, Barbone B, Mari A, Aiuti F, Kleine-Tebbe J: Anaphylaxis after Argas reflexus bite. Allergy 2000, 55, 303. Siuda K: Kleszcze (Acari: Ixodida) Polski. Czesc II: Systematyka i rozmieszczenie. Polskie Towarzystwo Parazytologiczne, Warszawa 1993. Spiewak R, Szostak W, Kubicka K, Ciura D, Lundberg M, Johannson SGO, Buczek A: An "endemic" of allergy to pigeon ticks (Argas reflexus) after removal of dovecotes. In: van Wijk RG, Frew AJ, de Groot H (Eds): XXIII EAACI Congress, Amsterdam 12-16 June 2004, Abstract Book, 157. Amsterdam 2004. Veraldi S, Scarabelli G, Grimalt R: Acute urticaria caused by pigeon ticks (Argas reflexus). Int J Dermatol 1996, 35, 34-35. Wojcik AR, Wasielewski L, Zbikowska E, Grygon-Franckiewicz B: Argas reflexus (Fabricius 1794) przyczyna akarozy u ludzi. Wiad Parazytol 2001, 47, 61-65. Document created: 17 June 2006, last updated: 20 May 2013.